This is the era of internet and seldom does a day pass by without being online. The most crucial factor for many of us is the comfort level with the browser whenever we are online. Internet explorer is the oldest web browser in the market and over the passage of time several other web browsers were also available in the market. The web browser named Netscape started quite appreciably, but subsequently it washed out from the market. Presently, the Mozilla Firefox is one web browser, which has surpassed the entire competition. It is one of the most preferred web browsers. For those who are not aware about Firefox, it is the free web browser provided by Mozilla. Presently, it is available for all the major operating system such as Windows, Mac, and Linux. Considering that, Firefox offers all the awesome features, which a basic web browser would require, it is a strong competitor for IE. It features tabbed windows that facilitate to open more web pages within on single window of Firefox. You have the ability to choose any window from tabbed windows instead of opening different windows every time from the taskbar. It also has in built pop up protection feature. Additionally you will also find Google search option, inbuilt phrasing protection, etc. All the Firefox configurations are prepared for enhancing the experience of web browsing. It is still possible for you to speed up Firefox. Several aspects play a crucial role in increasing the speed of the web browser. These aspects are internet connectivity, web server you trying to visit and most significantly the profile of your computer hardware. These tricks will help you to boost up the speed of your Firefox. 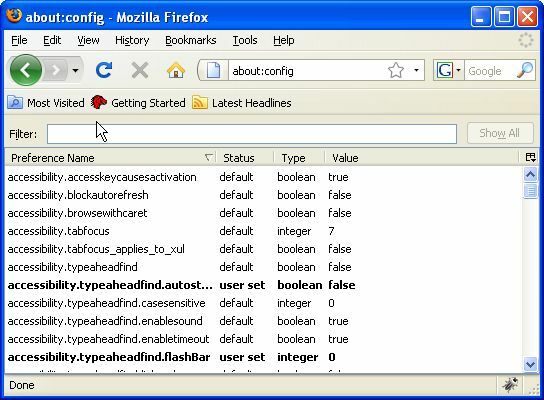 Initially you have to open up the editor in which you will be able to configure the Firefox. 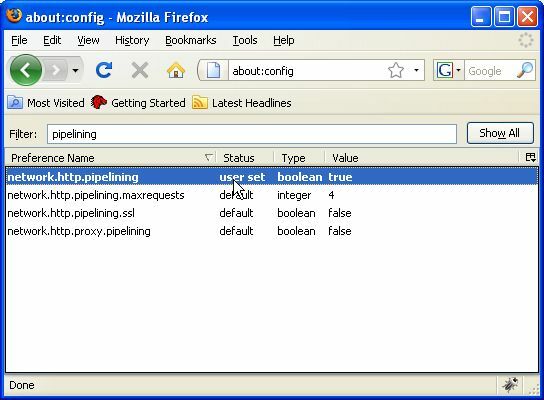 To accomplish this open Firefox and then type “about:configure” into the URL bar and press enter. A page will open up with a warning message. Read it cautiously as what you are going to do is actually for an expert user who exactly knows what they are doing. If you are not an expert, this guide will help you with all the essential details. To begin with, you must be aware of the meaning HTTP. It means “Hyper Text Transfer Protocol.” Whenever you open a webpage, a request has been transmitted to the web server through this webpage and reaction comes to the browser, which the browser displays on the webpage. All these transmission is done in HTTP. At this moment, whenever you open single page, browser is required to send several requests towards the particular web server for obtaining full data, which is required for displaying on the web page. A brand new technology pipeline is being used is Mozilla Firefox to overcome this issue. 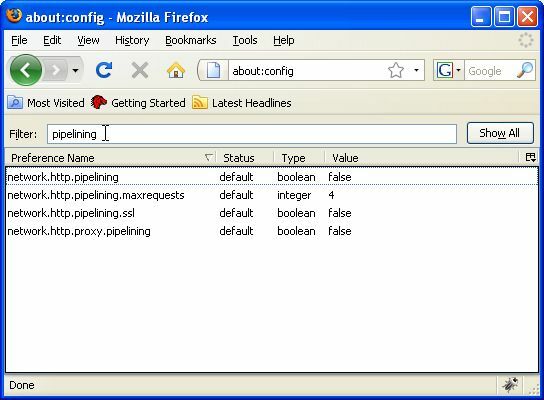 Utilizing pipelining, Firefox is able to send several requests to web server just before it gets any kind of response from the web server. It will reduce the loading time. 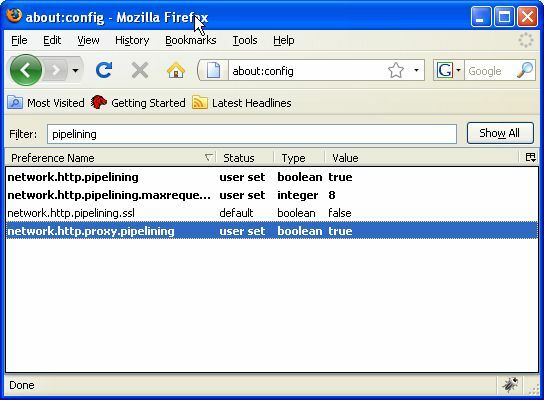 For configuring Firefox type “Pipelining” in the “Filter” bar. You will get numerous columns. All we need to consider is the “Preference Name” as well as “Value”. Search for entry “network.http.pipelining” in the listing and look at their values. If it is “false,” then double click and change it to “True”. Changing value to “True” enables Firefox to send several requests. Now we will have to change property value name “network.http.pipelining.maxrequests.” change the value to 8 from 4. Now in order to enhance Firefox capabilities, look for “network.http.proxy.pipelining.” change the value to “True” from default “False” value. 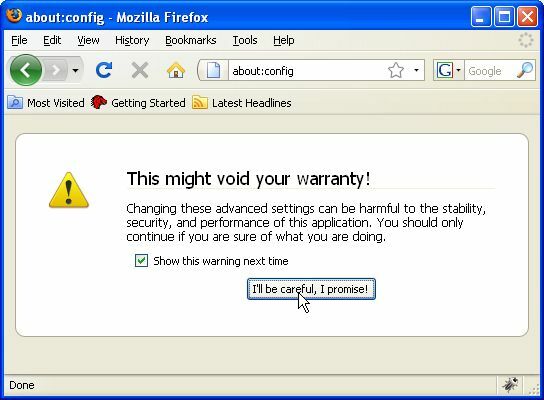 These are the most essential settings, which will enable you to boost the Firefox performance. With the help of these settings you will be able to browse internet at amazingly great speed. To do the required changes you should be aware of what you are doing, you must have the knowledge of HTTP and various other things so that there will be no problem with your web browser.